According to the most recent Census survey from the Australian Bureau of Statistics, the construction industry is the third highest industry (equal to education and training) in which Aboriginal and Torres Strait Islander people are employed, but only 10 percent of those employed are women. Aboriginal Employment Strategy (AES), Australia’s largest recruitment service for Aboriginal and Torres Strait Islanders, sees this as an opportunity for Aboriginal and Torres Strait Islander women and is leading the way in changing this narrative. Two Wiradjuri sisters, Tara and Tarni Proberts-Roberts, are examples of the AES traineeship success story. Born and raised in Camden, and now residing in Sydney, both women held full-time positions in the childcare industry for over six years before taking the leap into the construction industry. “I felt that I had reached my limit with childcare and wasn't enjoying my time there as much. I wanted something to challenge myself with and learn new things," says Tara. Following in her sister’s steps, when Tarni was 25, she enrolled in the iTradie Program through AES. “I needed a change in career, to challenge myself and grow new skills. After seeing how well my sister was doing within her career in civil construction, it really motivated me to take a chance and start a new journey." Tara graduated with a 'Trainee of the Year' nomination in her region and state. She also received the' Trainee of the Year' runner-up for the country. “Being recognised as doing well in my career and studies helped cement the fact I’ve made a good choice in my career change”, says Tara. Tara was able to complete a Certificate III in Civil Construction and is now a 'dogger' (directing and advising crane operators) and labourer working on the new M5 in St Peters, Sydney. Tarni’s hard work and self-determination also paid off making her dreams a reality. After completing her Certificate I in Construction through the AES iTradie program, Tarni applied for a position at Lendlease Crown Resorts, Barangaroo as a procurement advisor. Tarni’s interview was successful and she became the first AES Trainee to be employed by Lendlease directly. This achievement was followed by Tarni receiving the first Les Tobler Program Excellence Award at the 2018 AES Graduation. “I am loving my new role as my day is split between different tasks, I feel like things are always different. I work with an amazing team, which I am extremely grateful for," says Tarni. “I feel like times are changing and it’s becoming [more of] a woman’s world. I am excited to see what is in store for the future of women in construction. I see how quickly and widely it’s spreading and I would love to see more women become involved. 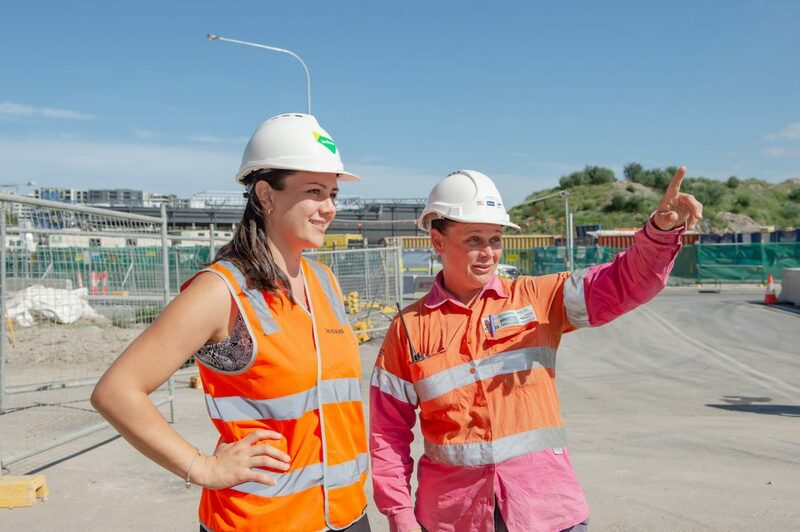 “I advise my Aboriginal and Torres Strait Islander sisters to apply for a role in the civil construction industry as it’s a very rewarding career. To see a project from start through to finish is amazing. The amount of new skills and information you’ll receive is huge. This is not just for men anymore. Whether you’re wanting an office job, driving trucks, cleaning staff rooms, operating heavy machinery, being a surveyor, health and safety rep or traffic controller/gatekeeper, it’s waiting for you. All you have to do is take a leap of faith outside your comfort zone," says Tarni. Kristy Masella, CEO of AES, has dedicated her life to empowering Aboriginal and Torres Strait Islander communities. She has worked in Aboriginal Affairs for more than 30 years across many portfolios in both New South Wales, Queensland, and the Northern Territory. Kristy has been integral in the development of AES employment programs for Aboriginal and Torres Strait Islander women.